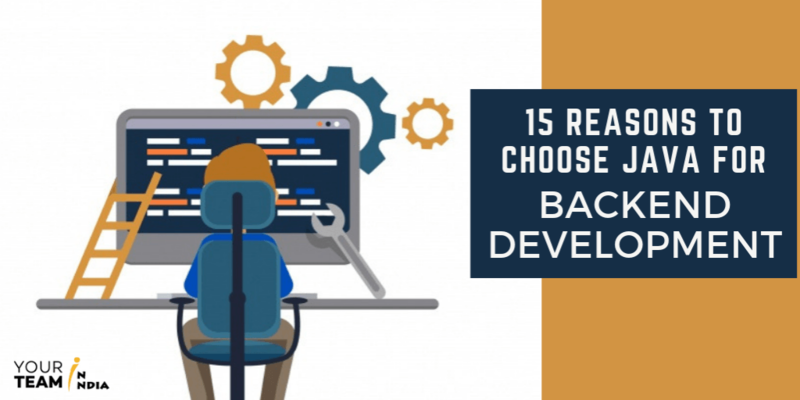 Java Backend Development | Reasons to Choose Java for Backend Development? If you want to start a debate amongst the developers, declare that one programming language is better than the other. Discussions will soon turn into arguments as everyone has a different perspective. And so on. But the fact is, that developers prefer the programming language that continues to exist for a prolonged period. Everything depends on the language characteristics, local ecosystem, and the problem domain. Anyone who has ever heard about programming knows that Java is among the top programming languages. The growing popularity of the language is due to the impressive features. However, there should be no competition about different programming languages as all of them inherit unique features. Java holds the top position according to TIOBE Index 2019 to be the best programming language in the world. For more than two decades, Java has managed to sustain in the development industry. In this long journey, the language has achieved many milestones and has been a crucial ingredient for making successful apps and software. The latest index of programming language’s popularity has declared Java as the ‘king of programming languages’. Let’s find out why Java backend development is the best solution! Initially, it was an elixir in the development world, but there came a time when programmers thought it would become replaceable. But the impeccable features that the language holds made it stay forever. Businesses big and small have found the language beneficial. Although, there are a few lighter and easier languages over Java but it is still a relevant solution for various enterprise applications. Believe it or not, it has been 24 years since Java was first created. From the beginning, the language has evolved and adapted to suit the latest market trends. There have been ample of features added with every release which keeps the Java programmers happy. The Java compiler is specifically designed for performance. The code is compiled into byte code and then compiled by Java compiler. Before converting into machine level code, the code runs through Java Virtual Machine. Whether it is a Windows, Android or iOS smartphone, Java-based apps are everywhere. We have now switched to Swift for iOS and Kotlin for Android apps, but developers having a strong Java base easily master these languages. Also, these are more improved versions of Java having a lot of similarities at the core. To make a mark in the Andoird app industry, Java is the key to success, and this is the reason why there has been a steep growth in the demand for the dedicated team of Java developers. Safety characteristics are built in Java and the runtime system. There are runtime checking and static type checking at the compile time. Having such features, it becomes challenging to invade a Java-based application from outside. The ease of coding any language makes it simple. This holds true for Java as well because it has a less ambiguous syntax terminology. Anyone can start right off with Java having the fundamental principles of programming. Being an Object Oriented Programming Language, it has various concepts that are relatable. Java has become a more accessible language that is flexible, system modular and extensible. Java supports principles like Data Abstraction, Polymorphism, Encapsulation, Overloading, and Inheritance. According to the backend web developers, this makes the language as powerful as C++. C & C++ are a very long tenured programming language that are also ancestors of Java & Python. Java resembles C & C++ but doesn’t have characters like pointers and multiple inheritances. So, if developers have an understanding of C and C++, it helps you to know the language in a better manner. During the ’90s this was the major reason for Java’s popularity. The tagline “write once and run anywhere” is enticing enough to grab lots of backend development in Java. This still exists as the main factor because most of the Java apps are developed in Windows environment and run in UNIX platform. Robustness equals reliability, and no other language except Java assures this. The highly supported web application development language is robust. Automatic memory management and garbage collection features make it portable across many platforms. Yes, this programming language is omnipresent. On the desktop systems, smartphones, web, embedded systems, or wherever you can think of. Having efficient stability and scalability, Java has become a universal programming language. For this reason, the demand is drastically increasing among the Java developers. This language is also gaining a big name in the field of Internet of Things. Java holds the multithreading capabilities. This means that you can develop highly interactive and responsive apps with the help of a number of concurrent threads of activities. Making it simpler, there is concurrent execution of two or more parts of a program for maximum utilization of the CPU. Java API offers everything that a successful program needs to know whether it is input/output handling, networking, utilities, query handling, database connection, XML parsing, data and time handing or anything else as per requirement. Do you know there are approximately ten thousand Java open-source libraries? Yes, that’s true. Apache Commons, Spring MVC, Hibernate are some of them. This is another reason why it is preferred for backend technologies. The cost of the development tools has an impact on the programming language’s popularity. If the tools are free to use, the developers will willingly utilize them. Since Java is an open-source language and free for all, almost all development tools are available for free download. This makes developers enthusiastically code in Integrated Development Environment especially if they are coding in DOS or notepad. Eclipse and NetBeans are two powerful development tools. They have plenty of useful features to make development faster like code completion, code debugging, formatting, refactoring, test server deployment, code management, and the list is long. It is quite simple to search, debug, refactor, read and write code in IDEs. Other than that, Java also offers tools like JConsole, Visual VM for profiling and decompilers. For the survival of any programming language, the developer’s community is important. The bigger the community, the more support the developers are likely to get and they will be using tools and libraries to make the programming/development easy and fast. You will be surprised to know that Java has 2nd largest StackOverflow community. There are innumerable backend developers, front end developers, and Android developers. Also, Java has 4th largest Meetup community with 1,400 Java Meetup groups completing over 580,000 members across the globe. This is not all, Java is the 2nd most-tagged language at Github that has over 1.5 million Java projects and 1100 have been starred by more than 500 individuals. Java is Here to Stay! The most volatile field nowadays is software development as there is a new programming language developed every other day. Java is certainly a magic potion that can take an enterprise into another level. This language used since ages is here to stay forever. The long commercial life and wide Java adoption by the developers for backend development have built a robust ecosystem of libraries, documentation, and frameworks aiming at e-commerce, security, and transactional architecture.